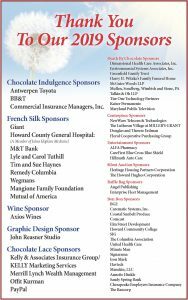 The Arc of Howard County’s 22nd Annual Chocolate Ball was held on Saturday, March 2, 2019 at Turf Valley Resort. The Chocolate ball is our signature event and our biggest fundraiser of the year. Proceeds support our mission of achieving full community life for people with intellectual and developmental disabilities in Howard County. This black tie preferred gala featured flowing champagne, chocolate from the area’s best bakers, an elegant menu, entertainment, unique Silent auction packages, and dancing throughout the night with music from Oracle Band. Than you to everyone who came out in a big way to support The Arc of Howard County. We appreciate all of our Sponsors, Celebrity Judges, Bakers, Entertainers, Donors, and guests! We had a wonderful time and raised a lot of money for the people we support and serve! More photos and thank you’s to follow!